Died: 20th November 1917; age 21; KiA. Medals Awarded: Victory, British War + Territorial Force War Medal. Relatives Notified & Address: Son of Mrs Emily E. Cousins, of Semer, Suffolk. 1901 Whatfield Road, Elmsett, Suffolk. Reginald was 5 years old and living with his parents, sister & widowed maternal grandmother. Thomas Henry Cousins, 38, a General Shopkeeper & Blacksmith’s Shop, born Elmsett, Suffolk. Emily Ellen Cousins (nee Skippings), 38, born Elmsett. Hilda Beatrice Cousins, 4, born Elmsett. Maria Skippings, 74, born Somersham, Suffolk. 1911 Post Office, Elmsett, Suffolk. Reginald was 15 years old, a Stationery Apprentice. he was living with his parents & siblings. Thomas, 48, a Blacksmith – employer. Emily, 48, a Keeper of Post Office – G.P.O. Dorothy Lilian Cousins, 9, born Elmsett. Thomas Rodney Cousins, 5, born Elmsett. Reginald’s father Thomas Henry Cousins, died 1912, Elmsett, Suffolk. Reginald is also remembered on the war memorial at St. Peter’s Church, Ipswich. Zero hour 03:00hrs attack along Bonavis Ridge by 12th Division. Tanks had moved up undeserved, three belts of barbed wire were crossed. 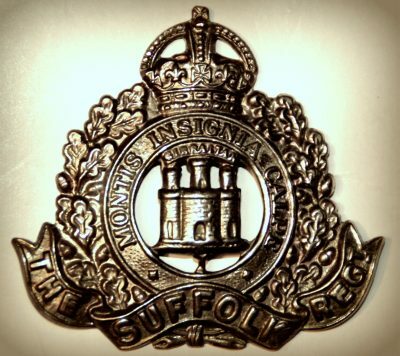 The 7th Suffolk’s and 5th Berkshire regiment part of the 35th Brigade had rapidly advanced and overrun the Hindenburg trench system. They encountered an obstinate resistance from Lateau wood area from sheltered German batteries where fierce fighting involving infantry and tanks throughout the morning finally took the enemy guns. Up to 30th November where a large German counter attack took place the Battalion would amount 232 casualties.